Have you been charged with a drug case? Maybe you are guilty, maybe you are not. But whatever the case may be... you had better know how to fight that case if you want to stay out of prison. You do not want to make the mistake in thinking that the case will be fought on the facts. That simply does not happen in the legal system anymore. Most criminal cases today are decided upon by Napoleon's definition of history: 'A set of lies agreed upon'. That being, prosecutors knowingly elicit false testimony from strangers, or your partners in crime. Prosecutors will bribe the state witnesses and intimidate your witnesses in an effort to make their job as easy as possible... which is getting a guilty plea out of you rather than spending the time and money on taking you to trial. The Drug Defendant's Handbook shows you how to fight a case on the law, not facts. In most cases the prosecutor will charge you with more than one charge. This is done in an effort to intimidate you and to use as a bargaining tool to get you to plead guilty. 8 out of 10 times, one of the charges is bogus and you can get the court to dismiss that charge before a trial ever happens. But you need to know what you are dealing with and how it all works. This book explains that to you. You may be reading this and thinking you do not have a drug problem so why read the book. The media is full of news today where cops are doing 'farming' or 'flaking'... that is where the cops plant the drugs in your car and then 'find' it. So arm yourself with the facts that will help you or a loved one if you find yourself in that position. 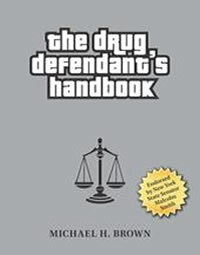 Get your copy of The Drug Defendant's Handbook today for only $30.00.